With the college basketball season wrapped up, many fans will begin shifting their focus to the pigskin. There’s no better time to do so than right now with spring practices ongoing and some schools getting set for their spring football games this weekend. Those looking for a football fix can find a handful of games involving teams from the Big Ten and SEC on Saturday. With a new head coach at Arkansas, a second-year coach at Purdue, and a couple of conference contenders in action, there are some good storylines to check in on. All games scheduled for Saturday, April 7. All times are Eastern. The Bret Bielema run at Arkansas has come to a merciful end and now Chad Morris is looking to pick up the tempo. We should get a good look at how much things will change with the offense, as going from Bielema to Morris is a contrast of styles. In order for that to click right away, Morris needs to have confidence in his quarterbacks, which means all focus should be on the top two contenders for the job, Cole Kelley and Ty Storey. Other areas on the roster will need improvement, like last fall’s 102nd-ranked defense in the nation. Teams picked apart the Razorbacks through the air last season with opposing passers compiling a rating of 147.12 last season (ranking 112th in the nation). The Arkansas offense figures to be the highlight of the spring, considering Morris and his new plan of attack, but the Razorbacks won’t improve much if they don’t get the defense to play better. Jeff Brohm’s first season as head coach immediately changed the outlook for the Boilermakers in a big way. However, Purdue ran into a wall by midseason with some games that reminded us of the school’s recent lack of success. But enough changed to make you think Brohm can make Purdue fun to watch again. Whether that momentum can carry over to 2018 remains to be seen, and we may have to wait until the fall to see how this all plays out. Purdue should be expected to give light workloads to some key players coming back from injuries, and the defense may have a few more holes that won’t be plugged until later in the summer. The chance of inclement weather could mean we learn very little from Purdue this weekend. Regardless of what we see or don’t see on Saturday, Brohm is still in the early stages of a significant rebuilding project despite taking some big strides last season. Auburn captured the SEC West and scored a pair of victories over two top-ranked teams on the way to a division crown. Of course, Auburn didn’t win the SEC championship and land its first spot in the College Football Playoff. Then the Tigers were upended by UCF in the Peach Bowl, allowing the Knights to proclaim a national championship for themselves. So how does Auburn bounce back from an 0-2 postseason after being so close to a shot at a national title? Like Purdue, we may not get a great look at what these Tigers will look like due to a rash of injuries. Players expected to be key contributors in the fall, including quarterback Jarrett Stidham, will be sidelined. But those out of action or given light workloads will give others a chance to show what they can do. 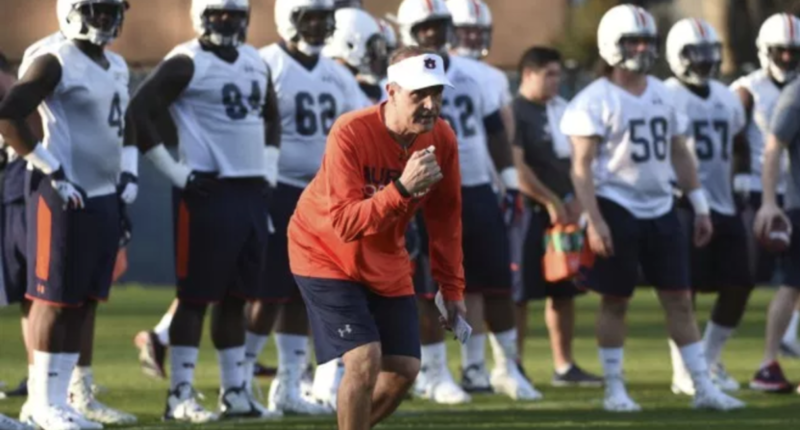 Could there be a hidden gem that shines for Auburn? The Spartans have several key positions locked down for the upcoming season, which should make them a team to watch in the fall. One area where the Spartans will look for answers is defensive end after losing Demetrius Cooper. Kenny Willekes returns for one starting job, but Michigan State hopes to figure out who comes off the other side of the line after showing great improvement at the position last fall. As outlined by the Lansing State Journal, names to watch include Justice Alexander, Dillon Alexander (who started last season, but is not a lock to keep the job) and Jacub Panasiuk, who has reportedly been emerging this spring. Mark Dantonio has options to work with, and that’s always good news for a coach. Things have not gone very well for former NFL head coach Lovie Smith in the college game. Needing a big turnaround season to provide some optimism off an improving recruiting effort, Smith hopes new position coaches will help with player development. This open spring practice could indicate whether those plans are coming to fruition. From Gill Byrd with the safeties to tight ends coach Cory Patterson and defensive line coach Austin Clark, there is a new unified voice spreading the message Smith wants to deliver this spring. Illinois needs that message to resonate in a big way. Otherwise, the Illini could once again struggle to get to a bowl game for the first time since 2014. And Smith could need to update his LinkedIn profile later in the year.